Opening April 1 at the Windham Art Gallery, Dana Wigdor presents a body of new work in celebration of the life and work of photographer Nancy King. Before her death, King expressed her wish to do a show with her niece, and Wigdor has honored her aunt with a visual conversation between two windows--photography and painting. Supported by a grant from the Vermont Arts Council, this show, entitled "Earth and Sky," bridges the artistic visions of painter and photographer. It pays homage to Wigdor's aunt, the photographer and violinist Nancy King of Northfield, Massachusetts. King died last October, leaving a photographic legacy that includes award-winning photography of landscapes, farms and sheep. 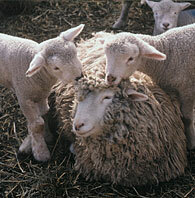 Her images have graced the cover of Sheep Magazine and appeared in Sea Kayaker Magazine. Her lamb photographs are particularly endearing, and her landscapes are still points in time and space. Wigdor offers her family and community an opportunity to remember King, while providing a vehicle for Wigdor to grieve the loss of her "other mother," who was her mother's twin sister. She provides her aunt with a ghostly machine, the "Violin Submarine," which seems to be searching beneath an ethereal ocean of glazed ice. Wigdor recalls, "I wanted to make my aunt a special craft that was part violin. When I was in Amherst looking at that field, it turned into an ocean. I wanted to go underground to the ocean. The violin [is] like a periscope; it will be bubbling under the fields of Amherst forever." Nancy King shows a talent for catching supreme moments in the natural world. Her photograph "Blink" is more of a blur, a blue cloud of a young lamb pronging in the spring air--an arched trajectory reminiscent of the nursery rhyme: the cow jumped over the moon. Wigdor responds by painting a canvas of sky dominating a blink of a landscape, like viewing the earth from a great distance. The work strives to create movement across the canvas in a subtly broken visual effect. She describes it as "a quick time lapse--like a flip book--like different frames." Wigdor has expanded her work to a full palette of color. In response to King's portrait of a tree blaring with a corona of autumn red, Wigdor creates "October" shimmering with rusty tones whispering from a still-white and soft olive-green landscape. There are two canvasses with one smaller elongated picture hovering over the larger landscape. She speaks of it as a "splitting off of death." This disconnect is dissolved in other paintings which seem to show a more settled sense of acceptance of death and grounding within her landscape paintings. Wigdor's "View from a Swing" reveals the landscape as viewed from her aunt's backyard: dark, mysterious evergreen forest with a sphere of light rising through a shaft cut through to the earth's core. The story embraces the dichotomy of light and dark, the glazed snow permeated with a meditative starkness. It is particularly poignant for the artist in recalling her aunt: "In her last weeks, I went to her house quite a bit, raked, her yard, brought her food. I saw her sitting in the swing--she was looking into that beautiful scene. It also shows a passage from that scene, a contemplation of the beyond. How I've dealt with grief: I've meditated on impermanence. Nothing lasts forever, no person, no relative, no living thing. In my sadness, I wanted to grasp onto something I knew would last forever. The only thing: the natural world. I wanted to hold the hand of something that was going to last forever, that was true about life, that is nature. Heaven is down into the ground--there's light under the ground. In her painting "Bridge," Wigdor evokes the nostalgia of her grandparents' family farm in Amherst, Massachusetts back to life. 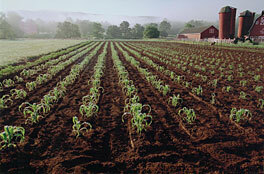 It is a broadly brushed work painted in response to her aunt's photograph of a farm in Northfield. Facets of emerald and gold give the work the work a cut jeweled effect. The softness of her palette has expanded from her usual wintry blue and white spectrum to the startling brilliance of spring, blurring the edges of the natural and supernatural worlds. Like the blurred vision of seeing through tear-filled eyes, this work is a blinding joy of new spring life after the death of winter's wear and tear. She notes, "There's an event that's happening in the unseen world--a transparency--superimposed on the unseen world." "The Night Jumpers" is a recognizable Wigdor extraterrestrial experience, depicting a blue-teal flapping contraption with a moon-like orb dominating the twilight-pearl sky. She recalls the natural stirrings of an April night inducing this vision: "I started in last spring listening to the peepers next to my studio. A creature emerged with a huge balloon-like bulb coming off its back, like the expanding throat of a frog." Wigdor describes how her work resides somewhere between the thin membrane of this world and beyond: "My work is always a bridge--the natural world with a supernatural world--the places in the paintings have elements of both--reflects my interest in Sci-Fi, out of body states, certain dissociative states, the experience of lost time." 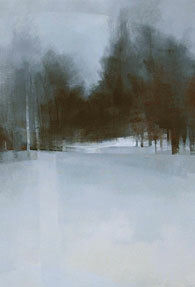 The addition of grief in the artist's experience is hinted at in the delicacy with which she paints her new landscapes. Shafts of light slice down into the earth while energetic spirit travels through dark forests, underwater and hovers in angular skies. These bridges between the twin worlds of earth and sky seem to be beckoning, perhaps lighting the way. There will be an Opening Reception on Friday, April 1, from 5 to 8 p.m. Friends of Nancy King will provide live music. Windham Art Gallery, 69 Main St., is run cooperatively by member artists from the tri-state region. Information: 802- 257-1881. Gallery hours: Wednesday, Thursday and Sunday, noon to 5 p.m.; and Friday and Saturday, noon to 7:30 p.m.
Diana Lischer-Goodband writes about artists for the Brattleboro Reformer and the Gallery Walk guide.